content for your target audience, second, you have to make sure it reaches your target audience so they can engage with it. The distribution part of content marketing is just as important as the creating part when it comes to building your audience. If you’ve ever created a piece of content, worked on it for hours (if not days) just to publish it into the saddening sounds of crickets you know how important it is. Great content marketers know they need to plan their distribution strategy just as carefully as they craft their content. Share it on their Facebook company page, Google+ company page, Linkedin page and Twitter account (with relevant hashtags of course). Go around the office and ask people to share / like the content they’ve just published. Sponsor a promoted post with their latest Facebook post, including a link to the relevant blog post. Feel that something just “isn’t working with our social strategy”. If you recognize this pattern in your content distribution behavior and want to start getting real traffic and reach new audience, I encourage you to keep reading this post. Don’t get me wrong, you should definitely post your new content to all your social profiles, but posting your link with a great status update won’t help your content get the distribution you’re looking for. Creating content and shouting it out of the top of your social media profiles probably will get you a few views, but won’t create the effect or traffic you’re hoping for – unless you’re already an influencer. Why? because the people you’re trying to reach aren’t there. They can’t hear or see your content because they are not following you yet. So how can you communicate your content to your target audience using social media? Find where they hang out. 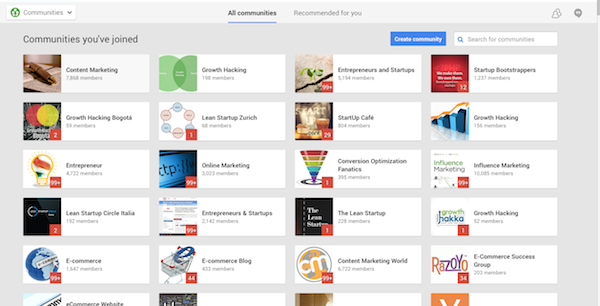 Google+, Facebook and Linkedin, all have their communities. On Facebook and Linkedin they are called groups, and on Google+ they are simply called communities. The best tactic to distribute new content is to find the relevant groups for you topic and share it with the community. To really get results, you first need to find the best groups and communities for your content and make some preparations prior to your first engagement, or else, you would just come off spammy and self-centred. I will demonstrate it using Google+ as an example, but the etiquette and method apply to all three social networks. Turn your topics into keywords and use them for search. In order to find the best communities for your content, you should try and do a search for each relevant keyword representing the topics you write about. Sure, groups around “content marketing” are relevant, but if there’s a group about “headlines” or “copywriting” they might also be relevant and sometimes better targeted for your niche. Group’s topic is a 100% relevant for my content topic. This step is necessary to make sure you don’t post in the wrong groups, or waste your time posting on groups that aren’t active at all. Step 3: Community or spam? Make sure they are real discussions and not a spam party . The problem with most communities is that they are either ghost towns (an option you’ve eliminated in step 2) or a hive for marketers to spam each other articles, which also, won’t be that useful to you. Go into the groups you found relevant and active and read some of the discussion. Double check those are real conversations with real people. Read the group’s guidelines. You don’t want to be a spammer or to find yourself ignoring the community’s etiquette. Remember you are walking into someone else’s party. Don’t ruin it. If you want community members to engage with your content and not just mark you as the annoying one, be mindful to how the group communicates. A little tip, most groups have an introduction thread, find it and properly introduce yourself. Engage with other posts. Go over the most recent updates and like / comment them. You need to make small interactions so that specific group members will already recognize you, and when you’ll post your new content there will be a higher chance they will engage with your content as well. Go over these 5 steps as many times as needed to properly collect and get involved with the right communities. Don’t wait for the last second because it takes time to successfully join a community and it’s crucial for your content’s success. If you’ve done your research right, you probably found about 30-50 relevant groups across all 3 major platforms targeting different keywords. Now it’s time to organize these groups in a way that will be easy for you to manage and track. Go to Google Docs (or your favorite spreadsheet tool of choice – I’m using Apple’s Numbers) and open a new file – call it “[your products name] – Distribution list”. We will use this spreadsheet over these 3-posts series. 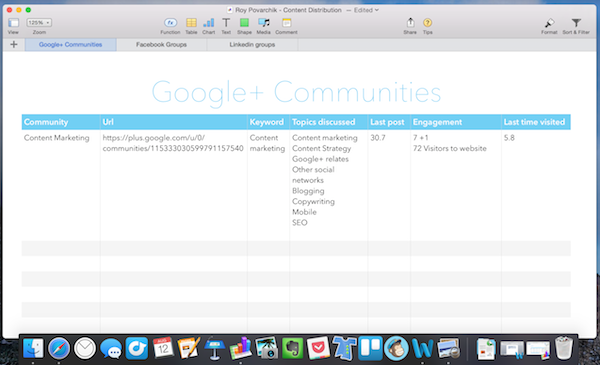 Open a new sheet and give it the name “Google+ Communities. In this document you are going to track the communities you’ve joined and make it easier for you to choose the communities you want to share your posts in based on relevant topics and track how well these community are working out for you. What are you going to fill in each column? Column A to E are self explanatory. Column F is for you to track how well is that community working for you. Of course you should always mix it up with the information you get from Google analytics. Column G is to make sure you come back and engage even when you don’t have a new post to share. My thumb rule is engage at least once a week on a not so active groups, once in three days on active groups is usually enough. Open two more sheets and name them “Linkedin groups” and “Facebook groups”, create the same table as you did for “Google+ communities” . Now, lets focus now on the money time. The moment you have a new post published and it’s time to distribute it. If you’re doing it right, your blog post has a specific keyword or a specific topic it’s focused on. We are going to use that keyword / topic to match it with the relevant groups you’ve just mapped. To do that, you will have to go back to the excel document we just created and look for the communities that match the same keywords (Column C) and topics discussed (Column D) as your new blog post. After finding the right communities for your content it’s time to share it in all the relevant places. Before you go and simply copy / paste your link time after time, remember that not all status updates were created equal. Posting a status saying “Here’s my new blog post!” and attaching an ugly link won’t grab the attention and drive the engagement you’re looking for. Write an engaging status update – Write a status update that is relevant to the group you’re sharing your content to. Use the keywords that are relevant to that specific group to grab their attention. If your post can be somehow related to a topic that was recently discussed by the community, mention that in your update and mention the people who were a part of the discussion. Formatting – People don’t read your content they scan it. Even when it’s a short status update. Make it easy to understand and to absorb even from a quick scan. Remember, you can break lines, you can create a contrast between long and short lines, use punctuation marks etc. Do whatever you can to give form and let the text “breathe”. Shorter posts – To get more engagement, try to keep your posts short. Actually, a post that less than 80 characters long can even get up to 60% more engagement. Sharing the right content, to the right community with the right approach will get you some amazing traffic and engagement for your content. Do the right groundwork and you will be able to leverage communities of thousands of people to build traffic and spread your content around. This is it for the first part of the secrets of effective content distribution methods. In the next part I will talk about using email outreach and contacting influencers to share your content . 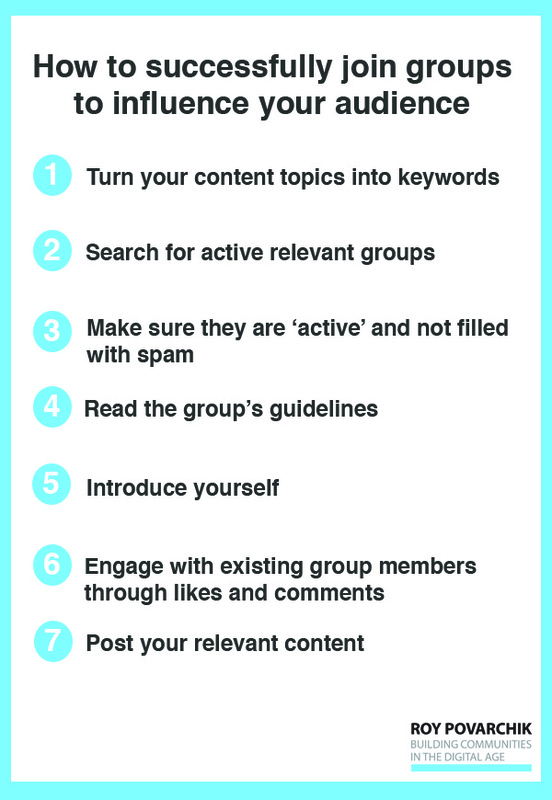 Are you currently active on content marketing groups? If so, please mention the best ones in the comments below.